Grant Gibson got his hands on a modern Chatter Telephone for his son, who didn’t seem particularly moved by it (probably because little black slab, Skype, etc.) So he decided to hack it into something a bit more interactive, and came up with this. A Chatter Smartphone. 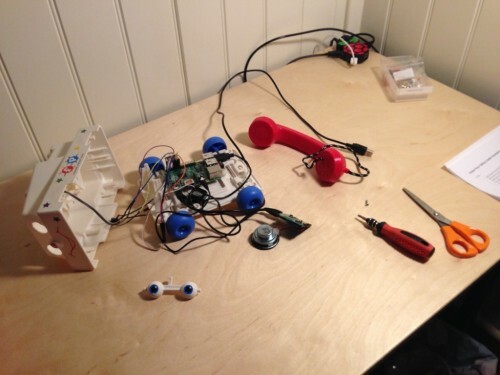 The rotary dial provides the inputs, sound is output through the modern Chatter Telephone’s speakers (the vintage ones didn’t have speakers, but the modern ones play clips from Toy Story), and he’s added a servo motor to control the googly eyes. This particular Chatter Smartphone has been set up to deliver weather information, cinema listings, and more; as well as offering information on demand, it can issue alerts, so Grant’s family knows when he’s left the office and is on his way home, or if the ISS is passing overhead. If you make your own, Grant has provided code so you can adapt yours to your own needs. You’ll find comprehensive build instructions, along with all the electronics help and code you’ll need, at Grant’s blog. Thanks Grant – we love it! Olde-Style dials! I want one. Smart phones should have a digital swipeable one on screen. Do it oldschool by click counting? We don’t have the full mechanism with governor but that needn’t bother us with modern clever electronics. Detect the dial direction to ignore the manual turning. Then count the clicks when they release. Use time filter to resolve the number dialed. This is how a Strowger relay in the exchange works/expects to see. I love it. Amazingly amazing. I recently built a USB-keyboard using an old Phones rotary dial and an attiny85 Microcontroller (using a Raspberry Pi as programmer, following this tutorial). If you are interested, take a look here. Now that’s just crying out to hack a Fona into. 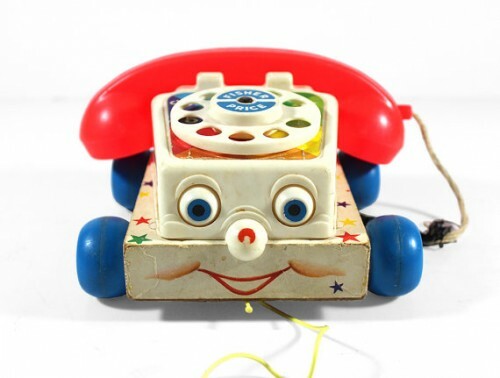 The odd thing is that our three-year-old does recognise things with rotary dials and giant handsets as phones, and I have no idea how.